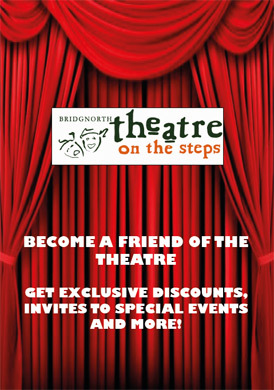 More information on the history of the Theatre on the Steps and other areas of Bridgnorth can be found in pamphlets by local historian Clive Gwilt. In about 1960 the Congregational Church situated on Stoneway Steps and known for generations as the Stoneway Chapel came onto the market as a result of the merger of its members and those of the Methodist Church which is on Cartway. They became known as the United Reformed Church. After two years a company of enthusiastic amateur actors and interested townspeople, under the leadership of Mr Peter Taylor, began negotiating with the church authorities for the purchase of the building. 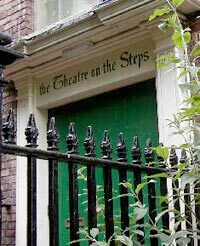 By the end of 1962 the deal was arranged and work began both on the raising of the capital needed with stage productions and coffee mornings, jumble sales, etc., going on in parallel with the work needed to convert the building into the small but intimate theatre it has become. This last effort involved stripping the interior of pews, pulpit and organ, these items finding new homes in other churches both near and far. Apart from taking all these items up the stairs, the conversion also required that a lot of material had to come down as well. The earliest requirements of course were for sand, cement, bricks, plaster and plasterboard, and even a thirty foot rolled steel joist had to be carried slowly down and manoeuvred carefully through the front doors and then lifted into position in the foyer until it supported the floor of the 'Green Room' above. A complete iron fire escape was manhandled down and into position for use as an emergency exit below the theatre. The internal staircase was also rebuilt using some of the redundant timber from unwanted pews. The early switchboard and stage lighting equipment was purchased from the Midland Institute, which was part of the old centre of Birmingham, which became redundant as bulldozers moved in. The theatre curtains also came from the same source. The first set of seats came from the Odeon Cinema at Coseley, situated on the Wolverhampton-Birmingham 'New Road'. Volunteers arrived early on a Sunday morning to start stripping the complete circle of about 200 seats, the only lights being the emergency lights set high overhe ad. With split nails and sore knees and bumped heads from unscrewing hundreds of woodscrews, the seats were loaded and transported back to Bridgnorth where they were unloaded, taken down the steps, and stacked in the theatre ready for installation. All these tasks were performed mainly by the members, but other work parties joined in at times. A voluntary team of prisoners were Shrewsbury Gaol did yeoman service doing a lot of the foyer conversion, staircase rebuild and the toilet block, before the scheme unfortunately had to be stopped by the Governor when one of the inmates absconded one sunny Sunday afternoon, being pursued by the police through the riverside fields, finally being caught somewhere on the Stourbridge Road, having swum across the River Severn to avoid capture. On 24th August 1662, 1,909 Commonwealth Church of England ministers were ejected from their churches and their homes. Andrew Tristram was the rector of St. Leonard's, Bridgnorth until he was ejected. He then began preaching privately in the town, and ministered spiritual matters to those, like himself, who had become Non-Conformists. They formed a congregation of independents and Presbyterian and met weekly. There was already a separate Baptists Society at this time. In 163 Andrew Tristram was asked to desist from preaching in Bridgnorth during St. Luke's Fair. In 1672 Tristram was given a licence to be a teacher at a house in the High Street where he practised as a doctor, but he was not allowed to preach. Two years later, Charles Owen was ordained to the ministry at Bridgnorth and became pastor of a church which probably met in a private house. At every meeting there was the chance of arrest since it was an offence to attend a Non-Conformist meeting when more than five people were present. The penalty was imprisonment or even transportation. The danger was very real and some 68000 arrests were made and between 5000 and 8000 free churchmen died in prison in England, some of whom had been there for more than twenty years. In 1689 a licence was issued for Andrew Tristram's house to be used for meetings ; it was renewed in 1694 and again in 1695. In 1709 a licence was issued for the building of a Presbyterian Chapel. When freedom of worship was granted the members built a chapel on Stoneway Steps. Andrew Tristram never did see this chapel for he died in 1706, three years before it was built. In 1722 the chapel was licensed as a Presbyterian Chapel and later during the 18th century became a Congregational Church. The old chapel was small and square and inside two large pillars rose to support the roof. The pulpit had a large canopy of 'sounding board' to aid the preachers voice. There was also a gallery to house the 120 members of the congregation, the maximum congregation in 1711. A few years later the side of the chapel collapsed and narrowly missed two passers by on Stoneway Steps. Many people were prejudiced against free churchmen which prevented any chance of a better site. The members of Stoneway Chapel had always received a certain amount of ill treatment at the hands of the local people. One minister, so discouraged, left in despair feeling there was no hope of progress. In 1769 there were 71 members and by 1784 this number had decreased to a mere 29. In 1809 Samuel Barber became minister and attracted more congregation and the chapel was no longer adequate, so a new chapel was planned. In 1829 the old chapel was demolished and a larger one built at a cost of £1000. This new chapel was opened for service on 25th October 1829, when the Reverend George Redford preached the service. Until 1841 Samuel Barber (the minister, and teacher by this time), lived in the manse next to the chapel. However during 1841 the manse was taken down and replaced with school rooms the following year. Samuel Barber remained for 36 years in which time the congregation increased four fold, and he became an outstanding school master. In 1837 the church was registered for solemnisation of matrimony. On February 8th 1894 the Reverend Ernest Elliot came to Stoneway Church and even stayed eleven years and was described as a fine preacher with Stoneway being his first church. The difference between Congregational and Methodist churches is quite small, and as early as 1859 United Prayer Meetings were held each evening at the three chapels in turn, Congregational, Methodist and Primitive Methodists. In 1962 the chapel closed and resulted in the union of the three chapels in Bridgnorth - the Methodists, Primitive Methodists and Congregational who then merged as the United Reformed Church and began worshipping in Cartway.